La Jolla, CA. The La Jolla Town Council will hold a fourth Hearing on the recent City actions to address the colonization of the popular Cove beach by California Sea Lions. The next Town Council meeting will be held on Thursday, July 13th, 2017, at 5:30 PM at the La Jolla Recreation Center, 615 Prospect Street La Jolla CA. Crisis in the Cove Hearing will begin at 6:00pm after the regular business meeting. 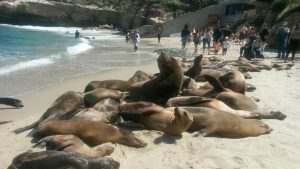 In the Spring of 2016 the La Jolla Town Council responded to community concerns about the serious public health and safety problems caused by California Sea Lion (CSL) colonization of the La Jolla Cove area and its detrimental effect on businesses and cancellation of athletic events. It created a broadly representative LJTC Community Task Force on California Sea Lions to develop recommendations to address the issues and identify safe and legal remedies. The Task Force recommended a solution and sent it to the City authorities in November, 2016.
dealing with it. The LJ Task Force strongly supports the “Preferred Alternative.” solution in their own consultant-funded report. However, the City retreats from its own Preferred Alternative in its own report to a human/pinniped beach-sharing solution. La Jolla has ample experience to know that this approach does not work. It inevitably leads to excluding human use for most or all of the year. Recently, (May 1) the City published a “Marine Coastal Management Plan – La Jolla” (MCMP). We see no evidence of significant input from the Task Force, Cove users, local businesses, or other broadly based Community representatives. The LJTC and the Community Task Force urges the City to: (i) Gather and respect input from the surrounding communities. These are the people who live near the CSLs, and their opinions should be considered. (ii) Implement MCMP’s “Preferred Alternative” to protect public health and safety. (iii) What we do know is that the City has a choice to make – is the beach for human recreation or CSL convenience? The La Jolla Community has treasured recreation at the La Jolla Cove and surrounding area for more than a century, and it very much wants to keep it. Come to the July 13th 2017 LJTC Monthly Meeting and let your voices be heard!